Many young children come into school with vast experiences in using a wide range of technology. As teachers, we have a responsibility to capitalize on this familiar knowledge and incorporate the use of technology, such as Ipad’s and specific ICT software and programs, as a valuable learning resource in the classroom. According to Jones, (2012) it is our job to find the best ways to incorporate and “embrace new technologies and use this resource to enhance meaning making in early childhood literacy” (p.31). The effective use of Ipads and specific apps can aid in a students early literacy development including their vocabulary, speaking and listening skills. 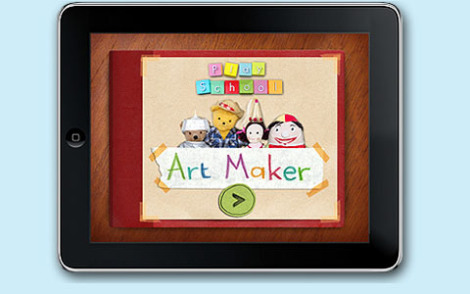 One such Ipad app, titled ‘Playschool art maker’, has been well received and effectively used by Matthew Jones, a kindergarten teacher at Wiley Park Public school. In his class, many students were developing English as an additional language and through specific scaffolding and teaching strategies, Mathew’s students effectively used this Ipad app to develop and practice their oral retelling skills. This app is very engaging as it takes on a very familiar appearance as the very well known and LOVED ABC children’s TV program, Playschool. Within this App, students take active control of developing their own individual or collaborative story, choosing the background scene and a variety of classic playschool characters to feature within their story. Once students have developed their story scene, they can record their own dialogue/narration and re-watch the story they have created. A highly engaging and fantastic resource that I would love to implement into a literacy teaching and learning sequence! Jones, M. (2012), ipads and kindergarten- students literacy development, SCAN, 31(4), 31-40. Today we’ve been looking at interesting and engaging ways to use an IWB within the primary setting. From some reading we have done on IWB(Higgins, S., G. Beauchamp, and D. Miller (2007), Reviewing the literature on interactive whiteboards, Learning, Media and technology, 32(3), 213-225.) it’s clear that when utilizing the IWB lessons, it should be interactive for the students. A Teachers’ interaction with the board alone is not enough! Here is an activity based on Shaun Tan’s fabulous book, The Lost Thing. Aim: to consider how visual features (colour, shot angles, contrast, lighting, symbolism…) evoke an emotional response in a viewer and explore themes of the book. 1. Conduct a short revision discussion on how visual features evoke an emotional response to the viewer through the use of colour, shot angles, contrast, lighting, symbolism for their choices. 2. Having read the book or watched the short film, view a selection of images that use different types of angles and visual prompts. 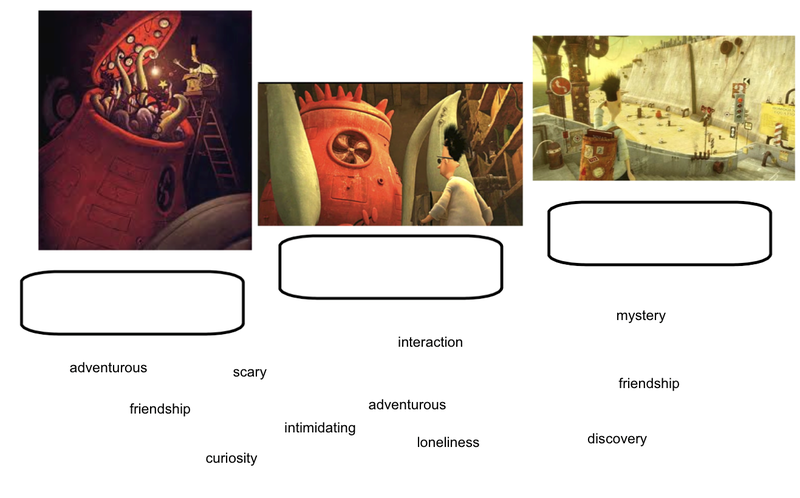 Have students come up and match key words to the image that best represents the mood, or the themes explored. When a student moves a word to a text box, they must give reasons for their choices (e.g. colour, shot angles, contrast, lighting, symbolism etc). 3. Working with the images and key words lead into class discussion (agree, disagree) and if certain words can be linked to 1 or more of the images. Here is my Scoop It account which has relevant resources for using wordless picture books with children in the classroom. I have just finished reading a fantastic article which outlines a teachers effective engagement with using a BLOG in her classroom. I am very fascinated by the amazing possibilities and advantages of bringing blogging into the learning environment. This is something I definitely would like to pursue with my future students to help them engage with their learning and to connect with others outside the classroom. I believe, blogging can be a fantastic way to build a strong community between the teacher, student and parents. 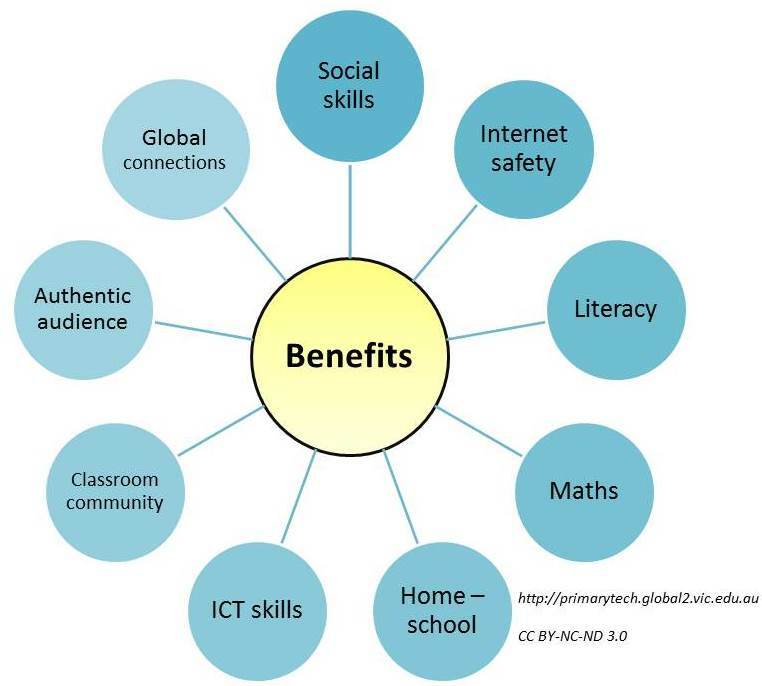 Blogs can be extremely easy to set up and maintain, they promote endless creativity and connect learning across all key Learning areas (KLA’s). learning does not stop at the door of the classroom” (Percles, 2008, p.8). * Images, photographs, video clips, audio clips, polls. * Calendars, maps and widgets. If used effectively, blogging can become a central element to how a class operates. Together the teacher and the class students can read the blog on a daily basis, read aloud new comments, discuss and joint construct answers to questions and responses to comments, explore and connect with other classroom blogs from all around the world and construct comments. Blogs can be highly engaging and relevant to students even when they are away from the classroom. The shared online format is perfect for allowing teachers to provide students with home projects to be completed and posted up for viewing the next day, for completing classroom tasks/homework as well as an outlet for any personal research or personal interests. 3. BLOGGING PROVIDES AN AUTHENTIC AUDIENCE. Blogs are an effective, authentic communicative tool for students to share their thoughts, ideas and experiences on the web and ultimately take interest and ownership of their reading and writing. Blogs have the ability to provide an real purpose to learning and the activities and experiences occurring within the classroom. Often the only audience of student work is the teacher, peers and parents. Blogs however, provide a much larger, global audience for student work and an avenue for feedback and self-improvement through commenting. Through engaging with a learning blog, students learn to self-edit their work and begin to really take pride in the work that gets uploaded onto a blog and strive to do their best for their impending audience. Here is a quick review of 3 fantastic classroom blogs that I feel are being used effectively. These blogs could be used to model to a stage 3 class in conveying what comprises a great learning blog. This blog is run by a teacher and his year 6 students at a Sydney based school. It is clear and well structured with a great display of learning experiences presented through the use of text, photographs and video clips. There are also a variety of posts written by the students about the cultural, sporting and other school activities, which the students engaged in throughout the year. I really like the fact that the running of this blog requires a different student to take on the role of being the ‘student reporter’ for a week. Check out this great example of an engaging and collaborative blog run by a teacher and her kindergarten class (6yrs) from Canada. What I particularly like about this example is that on the right hand side of the main page, you can click on the links of each students’ learning blog in the class. On each student’s individual blog is fantastic evidence of the learning progress, with posts consisting of photographs of students work/drawings and short video clips of that particular child’s learning/assessment within lessons. For example, there are clips of students counting by 2’s, making number groups with manipulatives and describing their understanding of capacity through hands on activities. I think this blog serves as a great model of how a blog can allow students and their parents to access and review the learning occurring in the classroom. A fantastic array of engaging learning across many platforms of digital technology is showcased on this classroom blog. This month for example, the class has collaborated together to create a class ebook based on Salmon. You can view screenshots of the ebook or download it to view and listen to the class read it aloud. What a great idea!! There are past posts about the class playing a game called, Mystery Number via Skype with other classes around North America. Seriously?!? That is amazing! Quad Blogging – with three schools from the UK. This blog is very well organised and constructed. The visually appealing photos of the students engaged in various activities really brings this blog to life! The blog also has many links, including learning links for both the students in the class and their parents to access and a link to individual student blogs, which feature their learning across all KLA’s. Their Twitter feed is also featured. Viewers of this blog can also choose to send the class a voice message by clicking on the ‘send us a voicemail’ icon in the top right hand corner. What a cool idea! The images shown on this blog really convey how digital technology, such as ipads, audio software and the IWB are serving to effectively engage students in their classroom learning. Very inspiring… who wouldn’t want to be part of this class. I would definitely use this blog as a model for all age ranges. This is a fantastic website run by a Teacher at a Victorian School. Her passion is educational blogging and global collaboration. She provides amazing information and resources to access. This is definitely worth checking out!! The puppet hosts of The Media Show do an excellent job in satirically presenting the viewer with an important issue to consider. In particular, this clip addresses the issue of creditability through the concept of “greenwashing”, which large cooperation’s are often perpetrators of, as they falsely mislead their audiences of their environmental practices through strategic branding and advertising techniques. As teachers, it is important to inform students that often such claims presented in new literacies might need to be checked and assessed for reliability. Students must become aware that they simple cannot assume that everything they view or hear, as in the case of digital literacies, is indeed fact. This YouTube clip is an excellent resource and a clear reminder of the power of advertising and branding. It could be used with students in the classroom to actively explore the role of image, text, music and video in successfully promoting, persuading and convincing the audience of almost anything! Students need to be aware that we can be strongly influenced positively and negatively by the attributes often presented in new literacies. As a viewer of new literacies, we have the ability to choose to step back and consider what choices are made by the author and why they might have been made. This is an important process and skill for students to learn. Key to this process is a students ability to adopt the role of a ‘text critic’ when looking at certain texts. ( Callow, 2013, p.100). Students need to comprehend, discuss and question the many conflicting beliefs, views and opinions presented to us within media. With continual and rapid advances in digital technology, the term, to be ‘literate’, is constantly evolving and being re-defined. How do we define literacy? A growing dominance in multimodal texts (visual, electronic, and digital online texts) has in fact established different ways of thinking (schemata), communicating and making meaning, than was once available in traditional views of literacy, however these traditional literacy skills are still the building blocks to comprehend and process the information of “new literacies”. The term “New literacies” can be used to encompass this transformation of the way we learn, communicate and interact in a society which is multimodal, multi-literate and increasingly in the digital domain (Houtman, 2013). “New Literacies” build on old literacies and are continually evolving, changing and adapting to our current time and culture. Houtman (2013) comments that “new literacies is a term often used in the field of education, particularly in literacy studies, for various digital literacies practices. A key concept here is that literacy if no longer a stable entity, but something that is continuously transforming” (p.6). “‘New literacies’ are best understood in terms of an historical period of social, cultural, institutional, economic, and intellectual change that is likely to span many decades – some of which are already behind us” (Lankshear, C & Knobel, M, 2012, p. 45). As society and culture changes, so will the definition of ‘literacy’. What we consider ‘new‘ at present (computer literacy) will not necessarily be regarded as ‘new’ tomorrow. In fact, most likely they will become the norm and second nature, as in the case of email and mobile text messaging, as we learn to navigate our way around their communicative demands. Whether we like it or not, we will eventually need to learn to adjust to these ever evolving changes and acquire the essential skills to use these “new literacies” effectively and to their fullest potential. This will always be a complex task but central to the future of our students in our classrooms. “New literature” will require 21st century students in the classroom to be literate in the traditional and foundational views of literacy (reading, writing, listening, speaking and responding). They will also need to be competent and fluent in different reading and visual processes, skills and strategies (decoding, evaluating and analyzing pictures, videos and sound) across an increasingly expanding range of communicative formats (social networks, digital devices, gaming, film and television). Our challenge as teachers is to prepare for and adequately respond “to the challenges of the 21st century learners by identifying skills, competencies, fluencies and literacies to be taught” (Houtman, E, 2013, p.1). New literacies will allow our students to create, mix, share, collaborate easily and sometimes instantaneously, opening up learning pathways to a whole new world of making meaning!